The Dalai Lama, the exiled leader of Tibet who is revered as a spiritual teacher, is at the center of a scientific controversy. New York, USA -- He has been an enthusiastic collaborator in research on whether the intense meditation practiced by Buddhist monks can train the brain to generate compassion and positive thoughts. Next month in Washington, the Dalai Lama is scheduled to speak about the research at the annual meeting of the Society for Neuroscience. The Dalai Lama has helped researchers study meditation. But 544 brain researchers have signed a petition urging the society to cancel the lecture, because, according to the petition, "it will highlight a subject with largely unsubstantiated claims and compromised scientific rigor and objectivity." Defenders of the Dalai Lama's appearance say that the motivation of many protesters is political, because many are Chinese or of Chinese descent. The Dalai Lama fled Tibet in 1959 after the Chinese crushed a Tibetan bid for independence. But many scientists who signed the petition say they did so because they believe that the field of neuroscience risks losing credibility if it ventures too recklessly into spiritual matters. 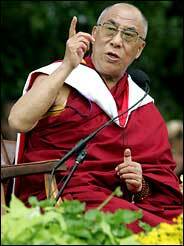 "As the public face of neuroscience, we have a responsibility to at least see that research is replicated before it is promoted and highlighted," said Dr. Nancy Hayes, a neurobiologist at the Robert Wood Johnson Medical School in New Jersey who objects to the Dalai Lama's speaking. "If we don't do that, we may as well be the Flat Earth Society." In the past decade, scientists and journalists have increasingly taken interest in meditation and "mindfulness," a related state of focused inner awareness, topics once left to weekend mystics and religious retreats. The Dalai Lama has been working with a small number of researchers to study how the practice of Buddhist contemplation affects moods and promotes a sense of peace and compassion. In one widely reported 2003 study, Dr. Richard Davidson of the University of Wisconsin-Madison led a team of researchers that found that 25 employees of a biotechnology company showed increased levels of neural activity in the left anterior temporal region of their brains after taking a course in meditation. The region is active during sensations of happiness and positive emotion, the researchers reported. In a 2004 experiment supported by the Mind and Life Institute, a nonprofit organization that the Dalai Lama helped establish, and also involving Dr. Davidson, investigators tracked brain waves in eight Tibetan monks as they meditated in a state of "unconditional loving-kindness and compassion." Using an electronic scanner, the researchers found that the monks were producing a very strong pattern of gamma waves, a synchronized oscillation of brain cells that is associated with concentration and emotional control. A group of 10 college students who were learning to meditate produced a much weaker gamma signal. Taken together, the studies suggest that "human qualities like compassion and altruism may in some sense be regarded as skills which can be improved through mental training," said Dr. Davidson, who is director of the Laboratory for Affective Neuroscience at the University of Wisconsin. Yet the neuroscientists who have signed the petition say that there are several problems with this research. First, they say, Dr. Davidson and some of his colleagues meditate themselves, and they have collaborated with the Dalai Lama for years. Dr. Davidson said he had helped persuade the spiritual leader to accept the society's invitation to speak, and was with him when he received the request. The critics also point out that there are flaws in the 2004 experiment that the researchers have acknowledged: The monks being studied were 12 to 45 years older than the students, and age could have accounted for some of the differences. The students, as beginners, may have been anxious or simply not skilled enough to find a meditative state in the time allotted, which would alter their brain wave patterns. And there was no way to know if the monks were adept at generating high gamma wave activity before they ever started meditating. "This paper has not tested the idea whether meditation promotes compassion or any kind of positive emotion," Dr. Yi Rao, a neuroscientist at Northwestern University who helped draft the petition and was one of the sharpest critics, said in an e-mail message. "Nonetheless, advocates of Buddhism and meditation have confused the public with the claim that this idea has received scientific proof," Dr. Rao said. "If one reads the published scientific literature, it is not difficult to see that this claim is far from being proven. It will not hurt if the public also realizes that some researchers are declared believers playing dual roles as advocates and researchers." In a telephone interview, Dr. Davidson said that the critics' assertions were overblown, given that the field of study was in its infancy and the studies so far had been exploratory. "I wouldn't consider myself a Buddhist or a card-carrying zealot at all," Dr. Davidson said. "My first commitment is as a scientist to uncover the truth about all this." He said it was "ridiculous" to suggest that neuroscientists should shy away from topics just because they were difficult to study. Many of his colleagues agree. "This research is a first pass on a new topic, and you just can't do perfect science the first time through," said Dr. Robert Wyman, a neurobiologist at Yale. "You get curious about something and you mess around. That's what science is in the beginning, you mess around." Fair enough, say some scientists who have signed the petition, but neuroscientists must be extra careful with such subjects. The field is already trying to manage a deeply mystifying presence: the brain, which in some ways is still as dark as deepest space. The scientists point out that scans showing areas of the brain that light up during emotions like jealousy or guilt are fascinating but that their significance is still unclear. And in their laboratories, some investigators who plan to attend the neuroscience meetings are trying to find the neural traces of consciousness itself, a notoriously disorienting quest that has led more than one enterprising scientist into a philosophical fog. "Neuroscience more than other disciplines is the science at the interface between modern philosophy and science," wrote one neuroscientist on the petition, Dr. Zvani Rossetti of the University of Cagliari in Italy. He added, "No opportunity should be given to anybody to use neuroscience for supporting transcendent views of the world." One thing certain about the Dalai Lama's scheduled talk is that he will not lack for an audience. Neuroscientists around the world have been intensely debating the event, and Dr. Carol Barnes, president of the neuroscience society, says she will not cancel the talk or change the schedule. "The practice of meditation is a human behavior, and the Dalai Lama is extraordinarily skilled at it and at promoting qualities of peace and compassion that I thought could bring us together," said Dr. Barnes, a professor of psychology and neurology at the University of Arizona who invited the Dalai Lama to speak last February. "That's not the way it's gone so far."